On March 31, 2016 K.E.E.P. 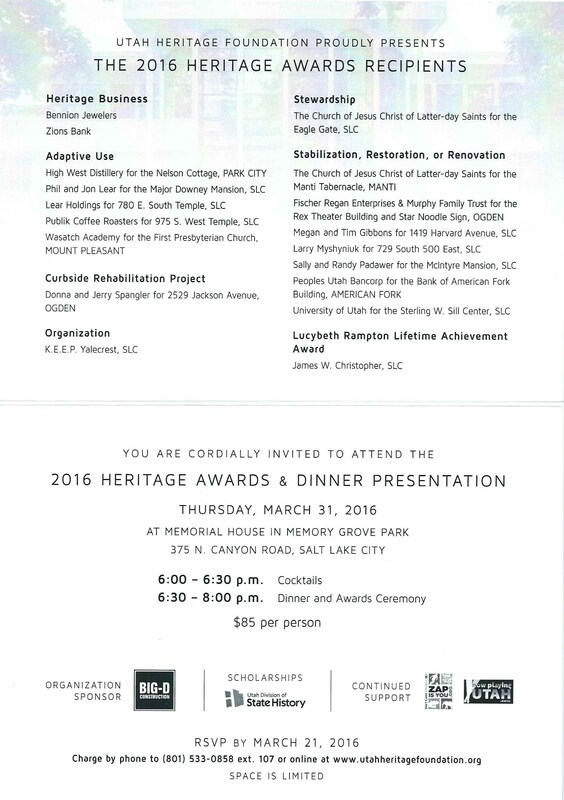 Yalecrest received the 2016 Heritage Award for Organization from the Utah Heritage Foundation. It was a privilege and honor to accept this at their annual banquet. 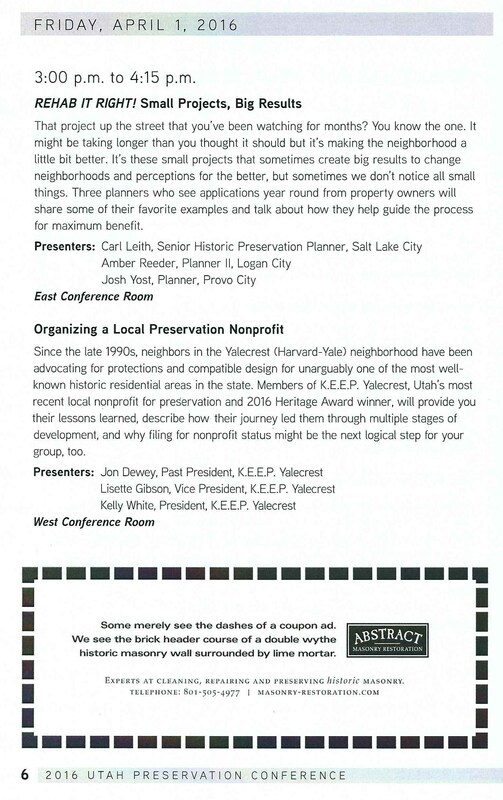 Additionally we were asked and honored to be presenters at their annual preservation conference. 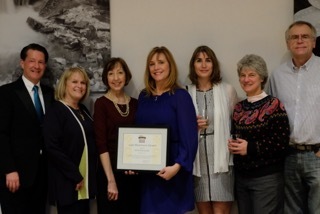 Accepting the award, original board members and supporters. 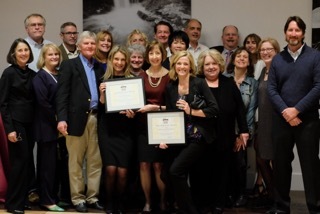 You can call this group “early Yalecrest preservationists” because historic preservation is really about people and building community. It’s people coming together to learn, honor and celebrate our past and present… and working together on our shared future. That’s what I see in this picture of the Yale Camp Daughters of Utah Pioneers. This May 1933 Yalecrest photo, taken in front of Blanche Bower’s home at 1097 S. 15th East, shows the gals participating in a “Silver Tea” (an older fancy term for fundraiser). 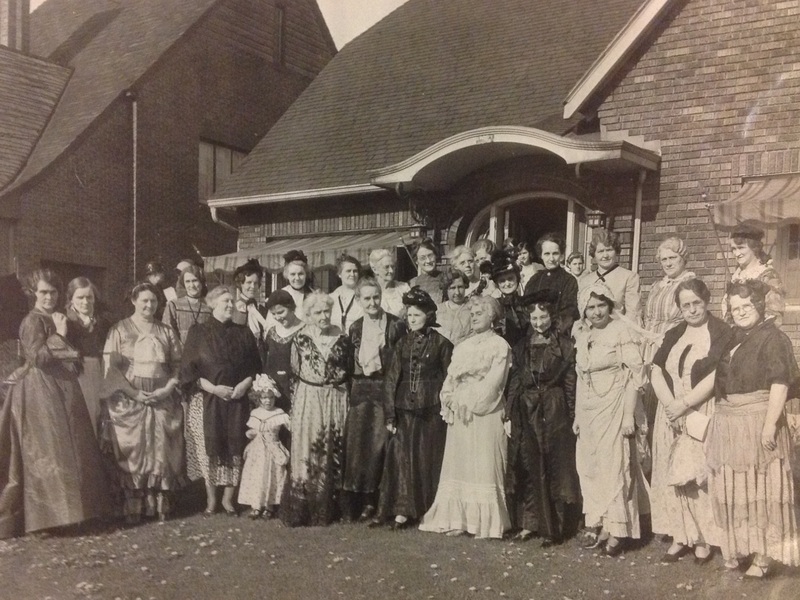 Over the years, lots of Yalecrest women were active participants in Daughters of Utah Pioneers. Meetings were held in various homes in our neighborhood. Yale Camp’s first official meeting was held at “Daughter” Cecil Besley’s house, 955 S. 1300 East, in 1924. At that meeting “Captain” Elizabeth Liddle made a plea for the preservation of historical material and relics… kind of like K.E.E.P. today. “Yale Camp” by Daughters of Utah Pioneers, 1933. The Salt Lake City Weekly newspaper printed the following blurb Oct. 9 in its “Hits & Misses” column. It’s a great summary of the last few year’s of the destruction—and desire to stop it—in our neighborhood. 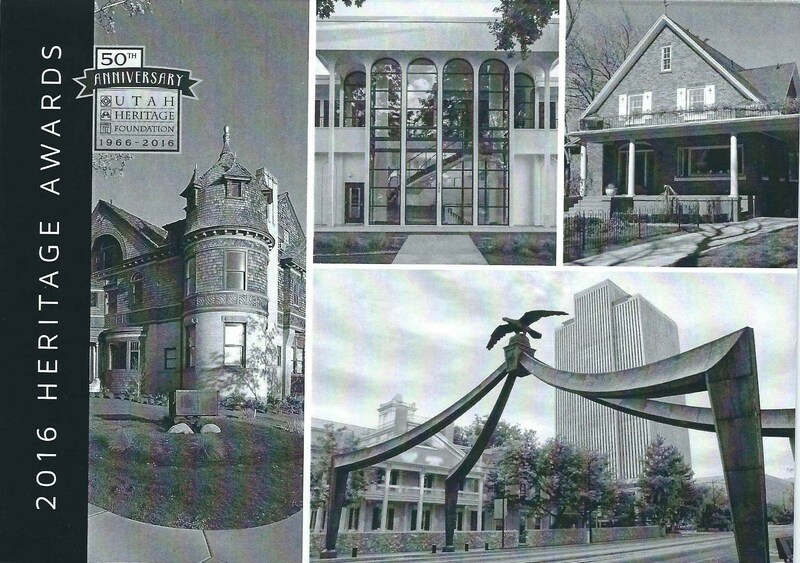 It has been a long, hard haul for preservationists, who faced a legislative moratorium on the creation of historic districts thanks to a 2011 bill that effectively opened the neighborhood to teardowns—there have been 23 over the past decade; about five a year, according to the Utah Heritage Foundation. 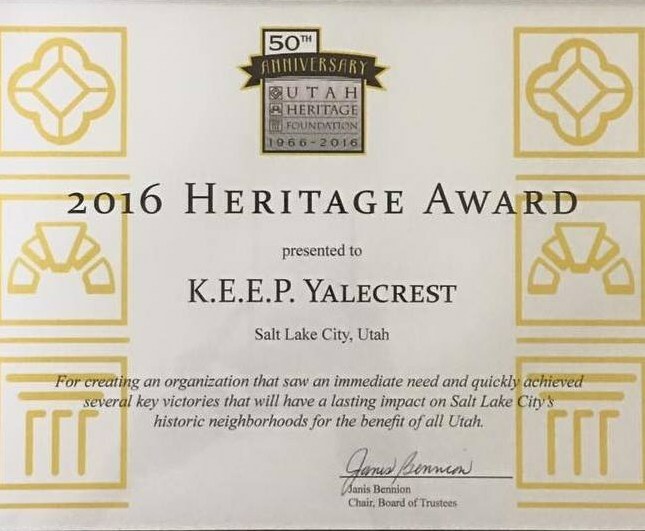 Now the moratorium has been lifted, and Salt Lake City’s Yalecrest area has started a nonprofit called K.E.E.P. Yalecrest to educate homeowners and help preserve homes on the National Register of Historical Places. On Saturday, Oct. 12, the group will host a walking tour highlighting 15 homes. Meanwhile, the first application for a Local Historic District has been filed in the area. Preservationists may still have their day.